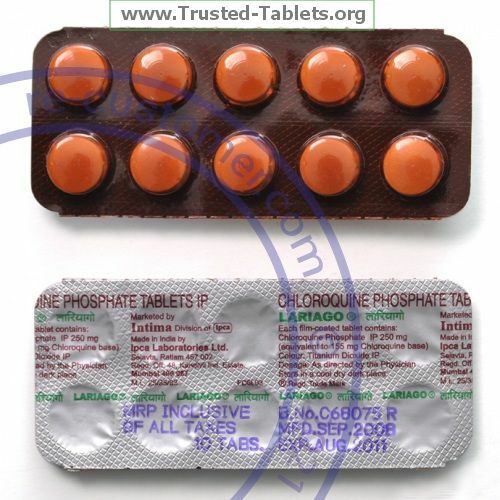 CHLOROQUINE is used to treat or prevent malaria infections. It is also used to treat amebiasis. Take this medicine by mouth with a glass of water. Follow the directions on the prescription label. To prevent malaria, take this medicine on the same day each week starting 2 weeks before entering the endemic area and continue for 8 weeks after leaving. Take your doses at regular intervals. Do not take your medicine more often than directed. Tell your doctor or health care professional if your symptoms do not start to get better in a few days. If you are taking this medicine for a long time, visit your doctor or health care professional for regular checks. If you notice any changes in your vision see your eye doctor for an eye exam. If you get a fever during or after you start taking this medicine, do not treat yourself. Contact your doctor or health care professional immediately. While in areas where malaria is common, you should take steps to prevent being bit by mosquitos. This includes staying in air-conditioned or well-screened rooms to reduce human-mosquito contact, sleep under mosquito netting, preferably one with pyrethrum-containing insecticide, wear long-sleeved shirts or blouses and long trousers to protect arms and legs, apply mosquito repellents containing DEET to uncovered areas of skin, and use a pyrethrum-containing flying insect spray to kill mosquitos. Avoid products with antacids and kaolin for 4 hours before and after taking a dose of this medicine.